TATS A KOOL CHALLENGE: Taking a break! Necessity FORCES me to take a break from my challenge...that and tatting like a maniac to keep up!! I had a wonderful shopping time yesterday in Dub's fair City! tatted a snowflake on the way up and another on the way home. The sun was shining and the sky was blue when we arrived having seen flooded fields all the way up in this sodden land,but within an hour the heavens opened and it poured down all day. I got some cool goodies tho'. 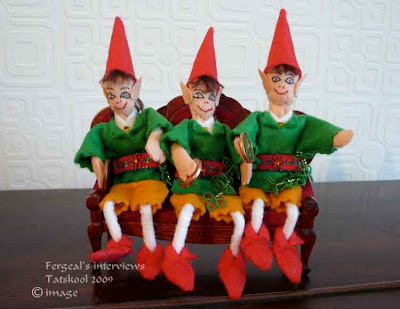 Now..you all know my Leprechaun Fergeal and his siblings.....well if you don't...where have you been living, obviously not in my corner of blogland! You can catch up by either searching for Leprechaun in my side bar labels..I see there are 10 posts OR in the search engine at the top of the blog. This helps me enormously when I can't remember if I posted some tatting or not! It might help you if you want to know how much thread to use for a project and I might have made it! sitting........................waiting for you to catch up.........................twiddling my thumbs.......................my hubby actually does this................while he is waiting at traffic lights.................who else does....................? OK welcome back now I don't have to explain any more! The problem is that he is such a gregarious little soul that his list gets longer and longer ...every day!! I keep telling him "Fergeal, how do you think I can make all those Leprechauns, have you any idea how long it takes just to make one???" So I finally put my foot down and told him that I couldn't possibly make any this year. "If you stop that silly tatting you would have plenty of time!" mmm I think I have heard that before!! Well anyway, Fergeal decided that there was no option but to take matters into his own hands, handicapped as he is by his lucky Irish cent. Nope, it's not what you think...he didn't borrow my felt, scissors, needles and thread.... he took the easy way out and he advertised in the Leprechaun Times....for Leprechauns willing to travel.... outside their homeland.....not afraid to learn new things...ambassadors for their country...and so on. You might think that this was the end of the story...Oh no! 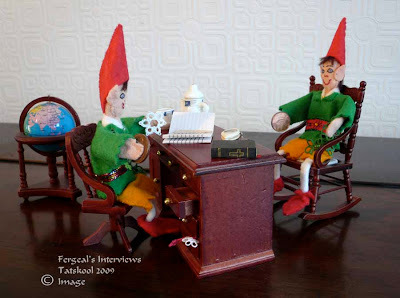 Fergeal decided that he had to interview them...to make sure that they were of good character and wouldn't let us down!! 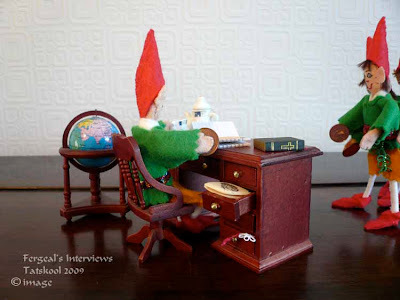 He said that he couldn't possibly interview them..where he normally lives...on top of the piano...watching me......Oh no!! he wanted his own office!! I hope it keeps fine for him I thought! Well it did..you may have noticed how the Leprechauns seem to get their own way...a lot. William has his own van and sets off whenever he feels the need....Oisin goes to college and let us not forget Brendan (the naviagator!) who was determined to see the world that he left his post and went AWOL! No we could never forget Brendan. It seemed that not only did he want a desk and chair...but he wanted to upgrade his entire lifestyle!! He told me he wanted antique Irish furniture....solid mahogany circa 1850 ( he has been watching too many Antique Roadshows! Well to cut a long story short, he got ready for the interviews... 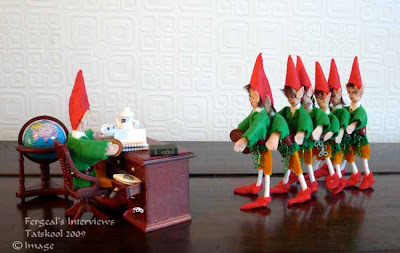 I looked up and there was a line of Leprechauns waiting for their turn....pushing and shoving and nearly falling over each other, so eager were they. A motley lot they look too! Now there are no prizes...(but you can guess anyway)....for guessing which day Fergeal chose for his interviews?? ?...think now think!.....or what he was going to ask them. All answers on a blank cheque please! ... the others relaxed on his new three piece suite!...and chatted amongst themselves...wonder what they were thinking...were they a teeny bit afraid of what they were letting themselves in for. 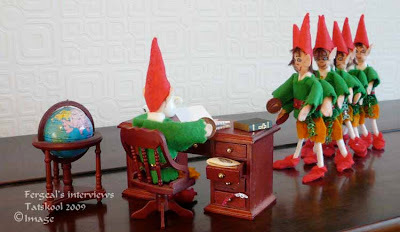 What was Fergeal holding in his hand and what was he going to use those books for that he had on his desk.....was he going to make them swear an oath....so many questions I was dying to ask...but i was going to have to wait...you can't afford to interrupt a Leprechaun doing his job.....remember that! Every now and again he would get up and go over to his antique globe (note that it's an antique...well he thinks it is anyway! ), give it twirl and peer into it and scratch his head. Finally, finally the were all sent home, and I got to quiz him. He was chuntering away to himself. "What's up lad?" I dared to ask. "One of them's a girl!!" was his reply. "A girl, I ask you who has ever heard of girl leprechauns...no such thing!" "mmmm! 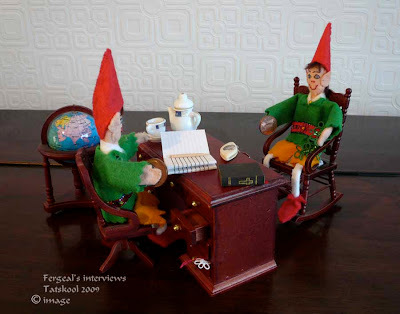 "I dared to reply, "if there are no girl leprechauns, where do you think you came from???" Well if looks could kill!! Looks to me like my brave little fellow fancies her, though he would never admit it. I asked him how he knew it was a girl!!! He tapped the side of his nose knowingly and said that he knew all right, she may have been dressed like leprechaun but it was the little things that gave her away!!! She was the first one that he called back and I did do a photo shoot while he wasn't looking.....but that's for another day. As for the others he said they knew sod all about tatting, some of them had never heard of it.....but they were all keen....well wouldn't you be he said if you were offered the opportunity to travel the world. I think he is jealous...he keeps on at me that I promised him a world tour!! 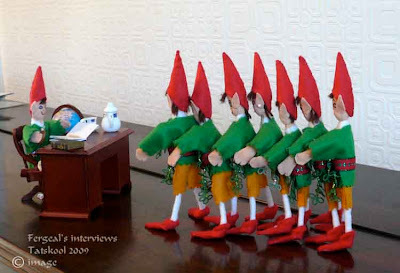 So anyway back to the job in hand....he has sent them away to the Lep Academy for their tatting/spy training and they just arrived back the other day. I wonder where he has decided to send them. I guess I will soon know. It's the Thin Edge of the Wedge, allowing him to move into such a grand office- and on a Sunday too!The next thing you know will be that he won't be satisfied with a coffee pot and cup and saucer on the desk, he will be asking for an Espresso machine! It's good to see that he takes his responsibilities so seriously! Killian has been after me to do some more tatting, but I must finish these dishcloths first! He's been giving me a hard time because I haven't used my Rainbow Brite yet. I told him I was waiting for the perfect pattern, and I think that I may have found it. He's such a rascal! Well, how about that! A girl leprechaun. I envy all those lucky tatters who will be getting a new tatting pal. Maybe it's time to put Fergeal to work helping you keep up with the snowflakes, too. OMGosh! LOL! That was such fuuuuuuuuuuunnnnnnnnnn reading! I love Fergeal & the new kids in the hood! That's some fine furnishings. I hope he appreciates them, but I have to say, when he was twirling the globe, I could see his mind twirling enviously along with it! heheheheh...can't wait to see where they go! I think Cormac wants me to take him home. He's been sitting in a cup full of honey stirring sticks for a very long time now. Holy Moly this post has made my day! My face hurts from smiling so much! Does Fergeal know how fortunate he is to have a servant....ahem....a mom like you? He is big in his britches now with that grand office and all. The last I heard from Brendan was at the Shuttlebirds convention. He popped in to let me know I shouldn't worry about him, that he was having grand adventures and that when he decides to come home he has many many stories to tell. Hmmm. After reading this post, I think that Dr. Von Threadmore must have some leprechaun in her lineage. She gets her own way all the time...... and wonders why I spend all my time tatting instead of winding skeins of white thread for her. I better not let her see this post however. or she might insist on her own set of office furniture. Donnacha is jealous of the desk and the globe; and, he is very curious ( I may say, too curious?) about the girl Lep! He said that he is tired of living alone and is really ready for more responsibility. I asked him about Leprechaun life (you know ~ that no girl Leps has me wondering too); but, Donnacha indicated strongly, but ever so politely that is 'classified' information. Well, what CAN one do? Once they say a subject is closed ~ it is closed. However, my life would be so boring without him! 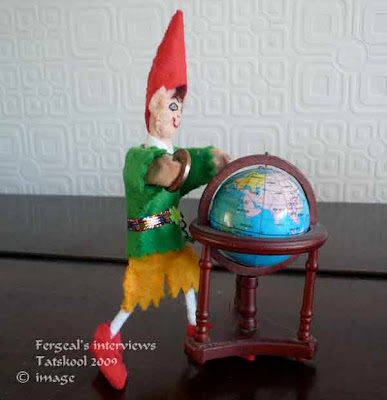 Have you ever thought of enlisting Fergal's aid in writing a children's book. I together you would be delightful storytellers. I do so love your stories. Finian says Hi and Happy Holidays. Oh, I loved the story! They are all so cute. Fergal is a very hard worker! I think he deserves a Christmas cookie for all his good works! ps.. Conor was so happy to see more cousins, and can't wait to see where they all go!